3. How do I edit my search results? How do I find a call number on the shelf? Follow these steps when you're looking for a book on the shelf. Find the correct letter combination. L comes before LA on the shelves. Look for the number - be sure to look for the whole number. 19 comes before 23 and 23 comes before 2340 (two thousand three hundred forty). How do I find a book's call number? Find the call number in the record (it is a series of numbers and letters). Use the building directory to match the first letter of the call number to the correct floor. When you search a database you may learn something about the topic, just from the way the database organizes your search results. Databases are enriched with meta-data-- information about the information-- that makes searching more sensitive, but can also guide you to new ways of thinking about the sources you see in your results. Subject headings and other facet systems can also help you learn more about your research topic. Vocabulary systems, like the Library of Congress Subject Headings in this graphic, guide you to more precise language and subsets of your topic. 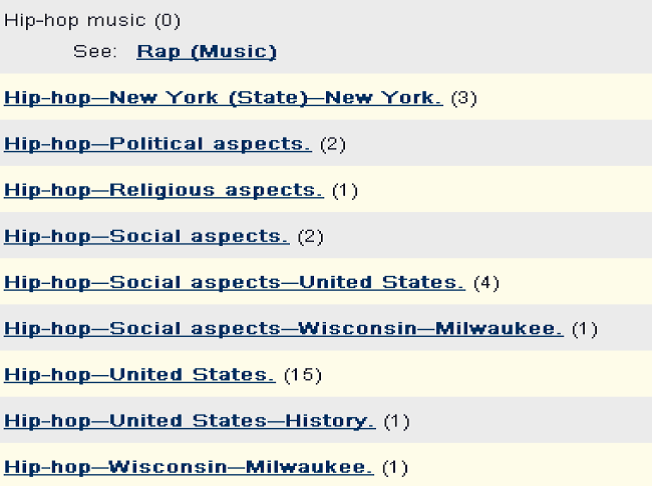 In this example of a search for Hip-hop, the database gives the user links to search Rap (music) as well as some narrower aspects of Hip-hop.The subject headings are like categories for discovering and searching more precise aspects of the topic. As you review the results of your search, subject headings and facets prompt you to ask critical questions about the results. What do I want to know about Hip-hop? What are the social aspects? What is meant by the “religious aspects” of Hip-hop? Large search systems like Search@UW use meta-data to describe books, articles and media. Tags are assigned to each source to provide descriptive organization for those sources in the database. When you review your search results you will see various facets that can be used to narrow down the results. You can use the facets to ask critical questions about the sources you see in the results. In addition to these basic facets, the database also tags each source with vocabulary terms to help you identify the key concepts in that source. As you review the list of vocabulary terms, ask yourself questions about how you want to work with the results. What specific topics in the list address your research question? For example, you may wish to explore aspects of Hip-Hop that are connected with Race. 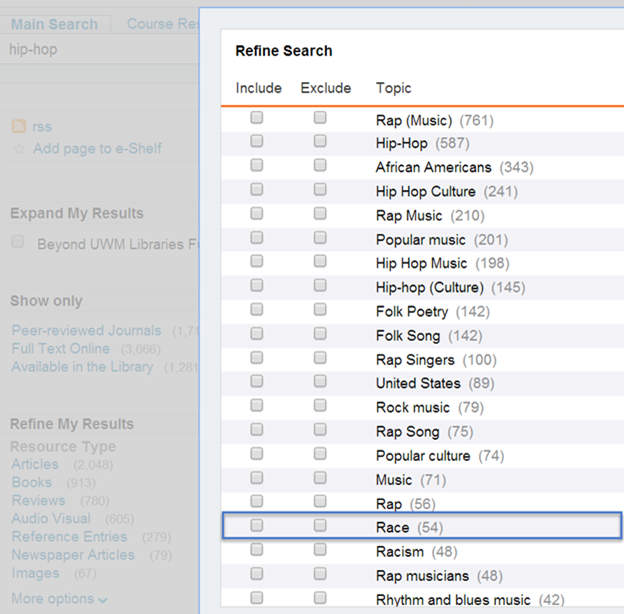 While the effect of choosing to include Race in your search results narrows down the number of sources, it also allows you to ask critical questions about the bigger topic of Hip-Hop with Race as the focus of your question.